Just wanted to share about the A+ experience I had at VW of West Palm Beach with my VW connoisseur Todd Moore. He's a friendly and personable guy that was extremely knowledgeable about every vehicle and took the time to answer all my questions. He ensured that every step of the process went smoothly. I had gone to various dealerships to test drive different vehicles, but none gave the kind of attention nor offered the kind of service that I received from VW of WPB and Mr. Moore. This didn't go unnoticed and you earned this guy's business! Now I'm off to enjoy my sweet new ride! At Schumacher Volkswagen of West Palm Beach, we don’t think buying a car should be a hassle. With our attentive staff, streamlined sales process, and diverse lineup of new cars for sale in West Palm Beach, Florida, we work to create a better dealership experience. With a selection of cars and SUVs that combine comfort, performance, and style, you can’t go wrong with a Volkswagen. We have all the latest models, including the Volkswagen Tiguan, the Volkswagen Atlas, and the Volkswagen Jetta. We’re also fully stocked with reliable used cars for sale. We also make paying for your next vehicle a breeze. Our dedicated finance experts will help craft a loan or lease program around your unique needs. Whether you’re shopping for a VW Tiguan, Atlas, or Jetta lease deal, our dealership can help you save with a long list of available specials. We’re not just the best place to buy your next Volkswagen. With a dedicated VW service center and a full stock of OEM parts, we’re also the best place to maintain your Volkswagen. Whether you need a regular tune-up or major repairs we’ve got you covered. 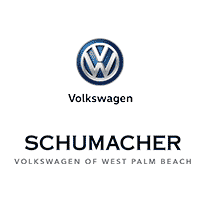 Visit our lot in West Palm Beach, Florida, to experience the Schumacher difference. We’re proud to serve Wellington and Palm Beach Springs. If you have any questions, contact our team at (844) 807-6811.